REGENESIS were retained to carry out the remediation design and site application works to treat groundwater impacted with hexavalent chromium (Cr VI) on the site of a former saw mill in the United Kingdom, Europe. Metals Remediation Compound® (MRC) and 3-D Microemulsion® (3DMe) were applied into the groundwater to provide rapid reduction and immobilisation of the CrVI present. Groundwater samples collected 2 months after application were analysed for CrVI , returning non-detect results. 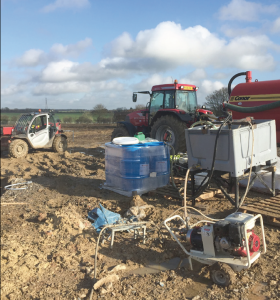 Due to the ground conditions of weathered limestone, treatment was carried out via pre-installed treatment wells at 5 m spacing in the source area and 6 m in the barrier. MRC and 3DMe were co-applied into these wells to target the source area of contamination and to install a reactive barrier at the down-gradient edge of the site to protect a nearby watercourse. MRC and 3DMe provide a powerful combination of wide distribution and strong reducing and immobilising properties. REGENESIS’ injection team completed the site works ahead of schedule to allow the groundwork contractor to prepare the site for housing development. The use of MRC and 3DMe allowed for wide spacing of the injection wells and therefore lower drilling costs. Metals Remediation Compound (MRC) removes metals such as dissolved Cr(VI) from groundwater via in situ immobilisation (precipitation and/or sorption to soil particles). 3-D Microemulsion is an engineered electron donor material that offers a novel 3-stage electron donor release profile, pH neutral chemistry and is delivered on-site as a factory-emulsified product..